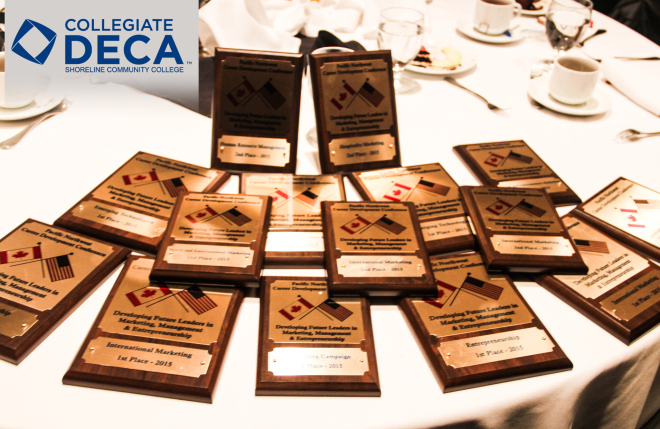 Shoreline’s DECA 2015 team returned from the Collegiate DECA Pacific Northwest Career Development Conference held Feb. 19-21 in Victoria, BC with five first place wins, making this year’s team the most decorated in recent memory. Of the 17 students representing Shoreline in 13 different events at this year’s conference, 15 students placed third or better. 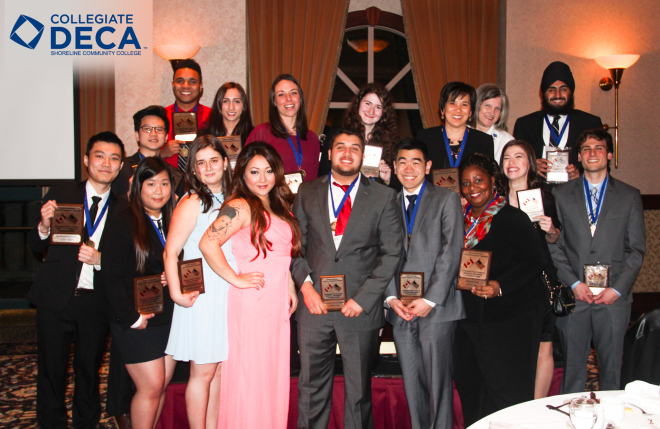 All 17 Shoreline participants qualified for the 2015 Collegiate DECA International Career Development Conference, April 17-22, in Orlando, Fla. The International Conference will involve 1,200 students from Canada, China and the United States. DECA has been active at Shoreline Community College since 1966 and this is the best overall finish by our students since 1992. This year’s performance is made all the more impressive by the fact that this marked the first year competing for most of DECA 2015’s members — only one of the several first-place-winning team members is a second-year DECA competitor. In addition, the team competing in the category of Emerging Technologies, made up of Nicolas Ho and (MJ) Munkhjargal Jambalsuren, both first-year DECA students, even managed to receive a perfect score of 100 points from each of their three judges. They earned this top score despite a setback that caused Ho to have to present his and Jambalsuren’s presentation alone.